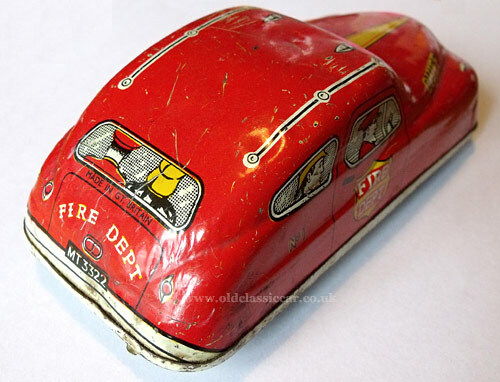 Mettoy Fire Chief tinplate toy car. On a rare visit to a toy fair, meets so often dominated by rail-related items and modern diecast cars, a few proper old toys were discovered. This is one of them. 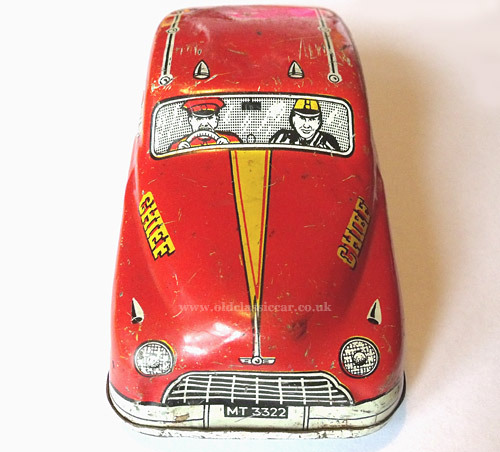 Produced as part of the Mettoy Playthings range in the 1950s, it's the bright red "Fire Chief" car, complete with firemen on board. The main body is a single lithographed tinplate pressing, attached to a tin base. The toy also features a friction drive motor (which works!). At one time it would also have had a working siren. It measures 6" in length. The registration - MT 3322 - is a nod to the toy's manufacturer, Mettoy, although the name itself doesn't appear on the car anywhere, not even on the tyres. Although not modelled on any one particular car, there are shades of Phase 1 Standard Vanguard about the side profile, and more than a hint of Morris Oxford MO at the front. 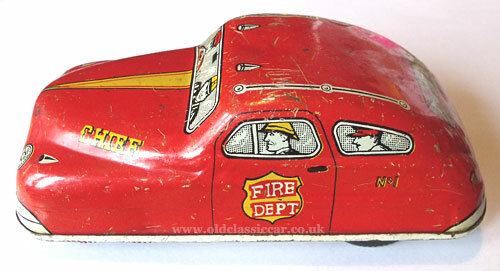 The Fire Chief car was part of a larger, fire-themed, collection of toys. This included a smart fire engine, and a cracking "Joytown Fire Brigade" fire station, again made in tin, with two opening doors. I bet the young child who received this, perhaps as a gift, or after saving up their weekly pocket money, really appreciated it and derived a lot of enjoyment from this classic British toy car. If only these things could talk.